Local MSP Stewart Stevenson has praised the high quality food producers of Banff and Buchan while also going on condemn the practices of the big supermarkets during a Parliamentary debate on sustaining agriculture and rural communities. 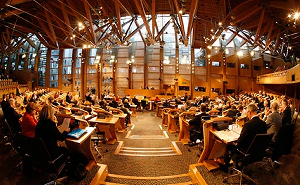 Mr Stevenson also went on to highlighted the need for Scotland to change its diet to that of a healthier balanced one. “These sectors help sustain rural communities and more must be done to promote and aid local producers. As it stands the supermarkets have a subtle monopoly over the food industry, this is driven not by health and healthy eating, but by margin and price. For example, they use known-value items—the few items on the shelf for which the general public have an idea of price—to create the impression that things are cheap. Banff & Buchan SNP MSP Stewart Stevenson has welcomed news that plans to expand the Renal Dialysis Unit at Peterhead Community Hospital have been lodged and approved. Mr Stevenson – who has campaigned consistently for increased dialysis provision in Banff & Buchan – had previously extracted a specific commitment to the Peterhead expansion from NHS Grampian. “This is excellent news indeed and I am pleased not only for those dialysis patients using Peterhead Hospital who will see the facility expanded but especially for those who are currently having to travel much further afield to receive their treatment in Aberdeen. “I hope that the necessary work can be carried out as soon as possible in order to have this expanded facility up and running.